I know some of you who read the blog are looking to do a project similar to what Dan and I have done. The problem is finding shells south of 125 that aren’t ridden with problems (legal, structural, etc) is easier said than done. Just today I found out about a place in the Mount Morris Park historic district that’s about to go on the market. It will need a total gut renovation – so it’s a similar sized project to ours. It’s a good sized place (I estimate it to be over 4,000 sq. ft.) so the asking price is a bit higher than some other shells, but it’s got the square footage to justify the price. There is a Certificate of No Harassment in place, so financing is an option, but even so you’re looking at a total investment (purchase + renovations) of around $2M for moderately high-end finishes. 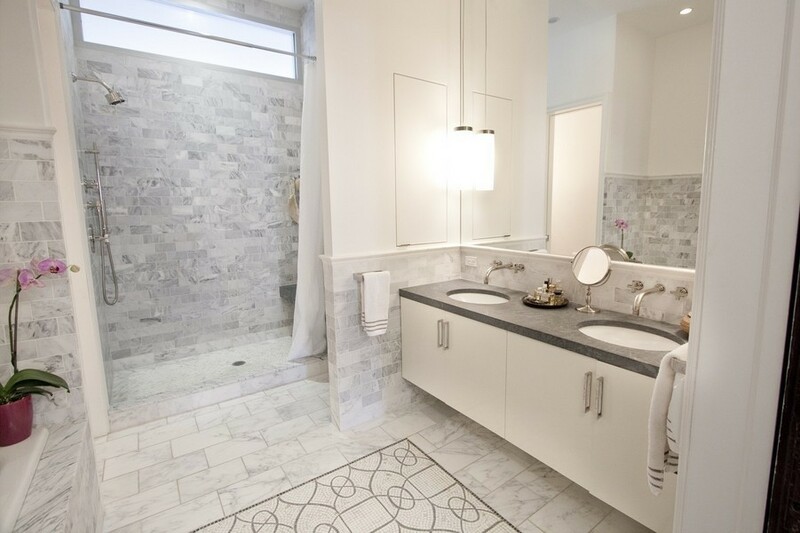 While you could do the project for less, that level of finish will result in the place being worth a bit under $3M when you’re done (assuming the market doesn’t drop) – so the project should be profitable. 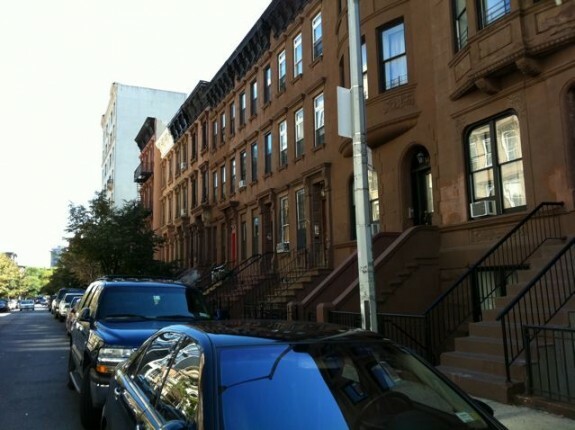 A year or so the Mount Morris Park Community Improvement Association began work to try to get the blocks between Lenox and Adam Clayton Powell landmarked. Currently they’re recognized by the National Register of Historic Places, but not by NYC’s Landmark Preservation Committee. The gray area is the part that’s landmarked, the blue area is on the National Register, but not landmarked – that’s the part MMPCIA has been working to get landmarked. 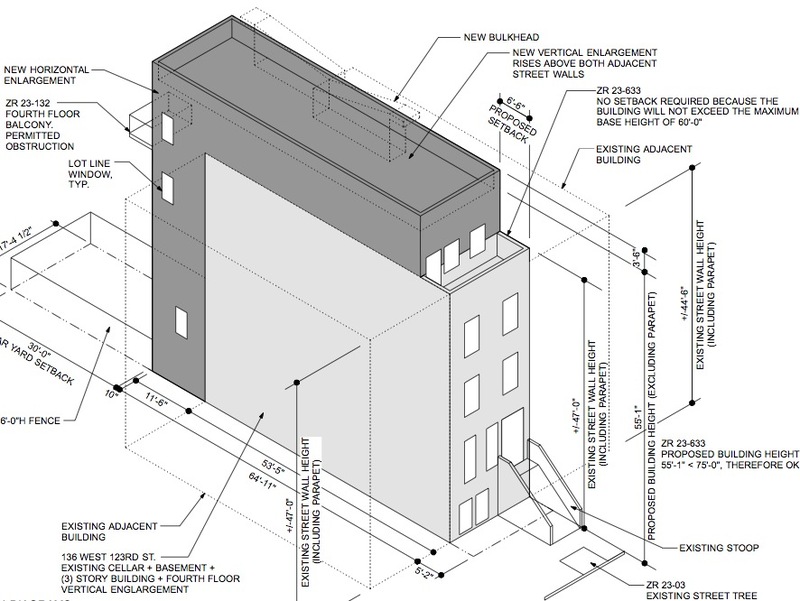 If we had been landmarked LPC could have mandated that the additional floor be set back far enough that it not be visible from the street. At least there’s some set back (6′ 6″), but a 10 or 15 foot setback would have been so much nicer. As sort of a side note, 136 W 123 was for many years the neighborhood hangout – mostly older (Belizian?) guys with who were pretty big into music. (We even bought a couple CDs off one of the guys – and they weren’t bad). There used to be a social club in the ground floor which had it’s ups and downs. The guy who lives behind them on 122nd Street still has a bullet hole in his window thanks to that club. When the club closed they just moved their socializing onto the stoop. They’re generally good guys, but their hanging out got pretty loud. Just the other day one of the neighbors I “met” due to the RCN incident told me she got only 4 hours of sleep a night during the summer because they were so loud. So 136 being renovated will really change the block since it was one of the remaining centers of the old culture on the block. 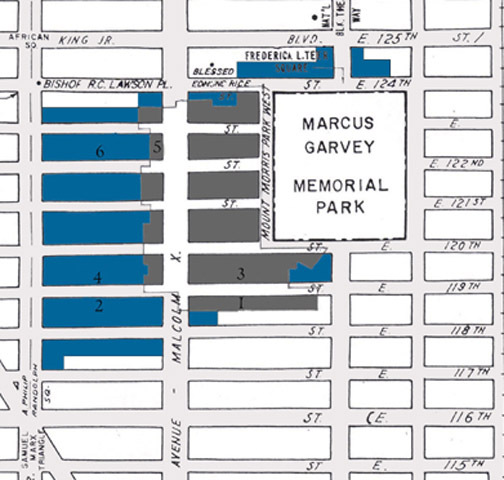 Back when MMPCIA started their push to get the blocks between Lenox and ACP landmarked, I wasn’t so keen on the idea. I still don’t think landmarking is warranted for the north side of our street which already feels like it has three zilliion styles of architecture. 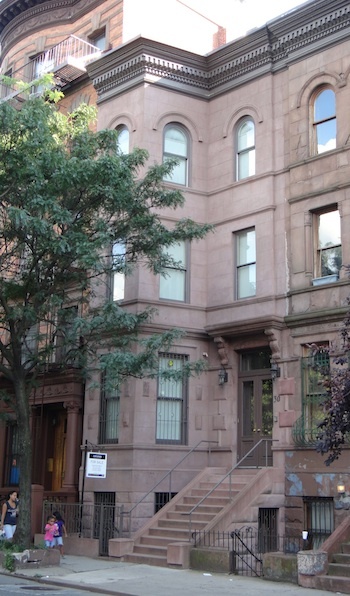 But as I thought about it, the unbroken row of 16 brownstones on the south side of the street was worth protecting – but once 136 gets rehabbed, that purity will be gone. We can never go back to what it used to look like. The architect seems like he’s got it in him to do a decent job. I just hope his client is spending the money to execute a good design. If we’re going to have a visible addition marring the view – please, just let it be fairly well designed. I just find it really odd that they had the money to add an extra floor, but not enough to restore their cornice. 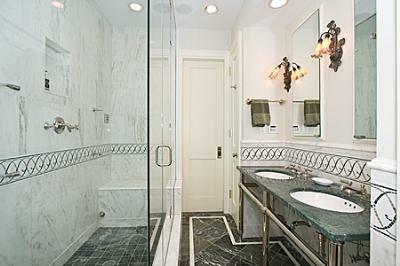 105 West 122nd Highest Sale Since Crash – $2.85M, $670/sq. 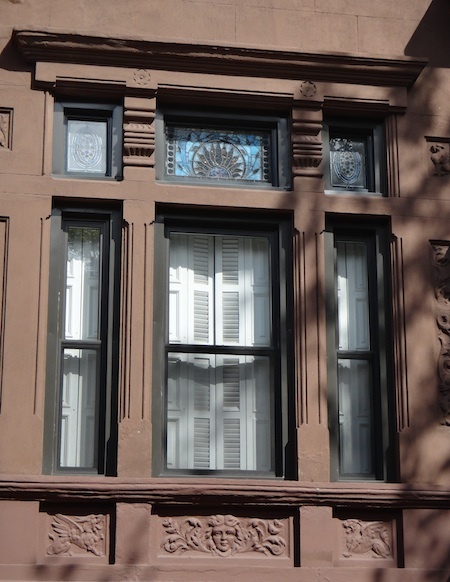 ft.
Well, the high end of the Harlem townhouse market is certainly doing well – especially in Mount Morris Park. First 30 West 120 sold for $2.5M ($568/sq. 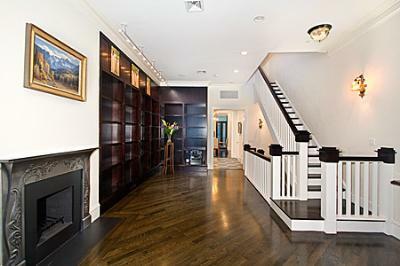 ft.), now 105 West 122 just sold in less than 3 months for $2.85M – a whopping $670/sq. 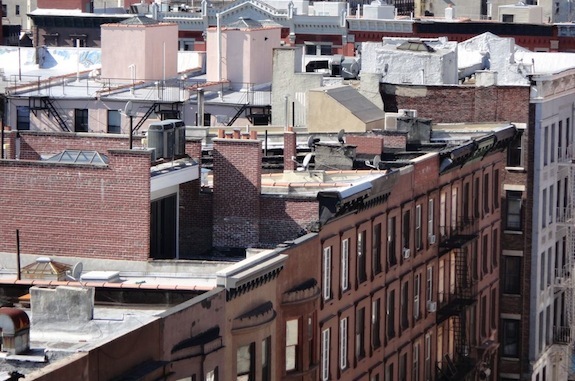 ft. Those sales aren’t outliers – The Wall Street Journal is even writing articles about the rise in prices in Harlem. 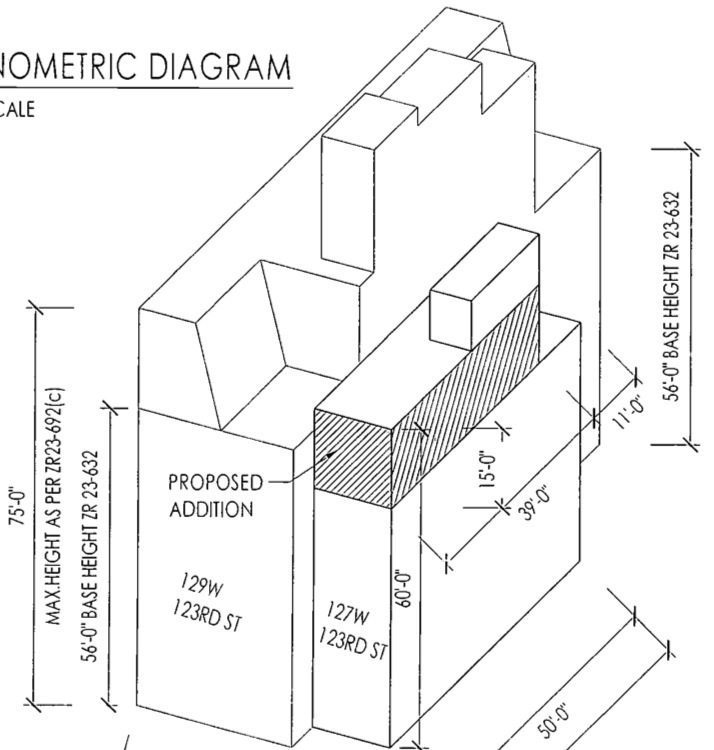 Admittedly there’s a lot to like about 105 West 122nd Street… It was recently converted to single family and prices for single family townhouses are typically higher than multi-family. Single family homes are luxuries and people pay good money for luxuries. The place is also a generous 19 feet wide with about 4,256 sq. ft. (including exterior walls) – 1,064 sq. ft. per floor, which is big. That said, at $2.85M and $670/sq. ft I expect perfection and there are things about the exterior that I personally find a little disappointing… Case and point is the newel post you see in the picture to the right – they didn’t restore the original ornamentation. The sister townhouses on either side have their detail intact – there were examples of what it should have looked like, but the previous owners didn’t take the time to do the work. Not a big deal, but at this particular price point I’d expect it to be done (30 West 120th’s façade work was impeccable). Also the façade is painted – which is something you do when you’re cutting corners to stay on budget (like we are with our place). Then there are the windows – they’re just inexpensive aluminum windows (see picture below). They’re in good condition, but at this price point I expect better quality. 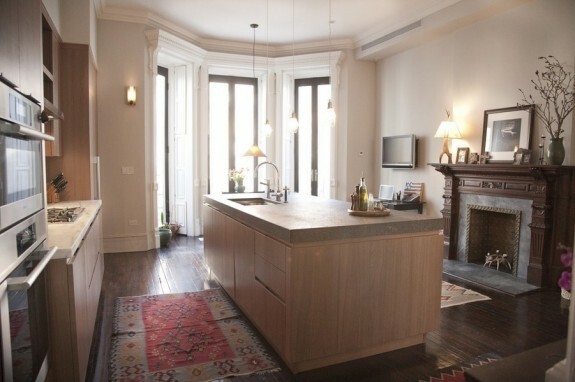 All in all it’s a great place with an excellent renovation (at least inside). It shows that if you spend time to do a good renovation it will come back to you when you go to sell. I get the sense that some people think we’re being a bit fussy about some of the details in our renovation, but a slightly higher budget and attention to detail really do pay off in the long run. 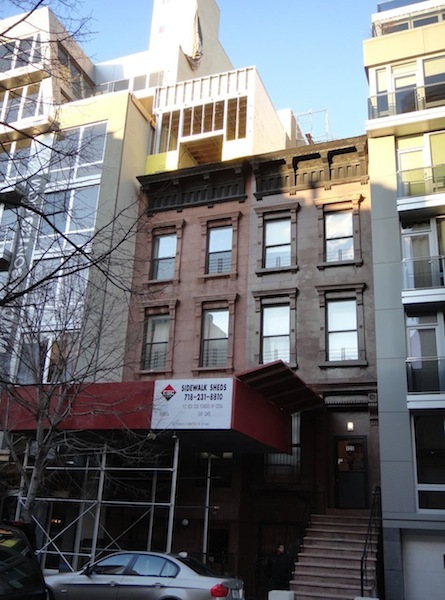 30 West 120 Sells For $2.5M – $568/sq. ft.
Less than a month ago I was a little worried about the lack of high end sales in Mount Morris Park. Well, there’s no longer a need to worry… 30 West 120th (across the street from Marcus Garvey Park) sold on August 29th for $2.5 million. That breaks just about all the sales records since the downturn in the economy 3 years ago. The house is “just” 18 feet wide (narrow for a house selling over $2M), but it’s roughly 60 feet deep so it has approximately 4,400 sq. ft. That means the new owner paid about $568/sq. ft. – so not only was the $2M barrier broken, but the $500/sq. ft. barrier was broken as well. Curiously, for such a high price, there’s a rental building on one side of the house and a shell on the other side. And with all the 5th Avenue traffic going around the park it’s not a particularly quiet location. This is good news for some of the 20 and 25 footers on more the coveted blocks just off the park – they should be able to go for even higher prices. 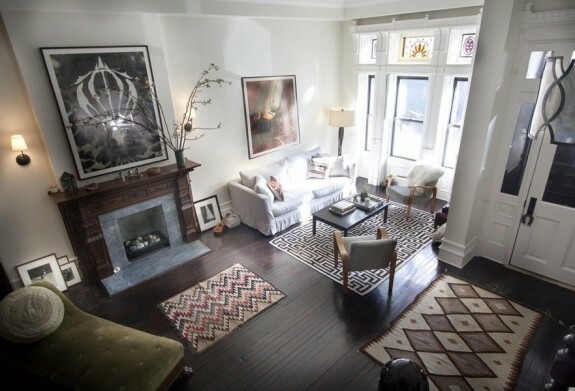 However, the house does have a rather good provenance… It was purchased by Kareem Abdul-Jabbar in 2002 for $525K. Between 2005 (the filing date) and 2009 (the sign off date) he did a gut renovation. The estimated cost of the renovation was $375K + $7,500 for sprinklers, but that was the estimated cost – the actual cost may have been substantially higher. Given that he was renovating at the height of the market it could very well have been a $1M+ renovation. Another thing to note is that the house was single family. That means the owner was buying a degree of luxury – a 4,400 sq. ft. home. We’ll also have a quadraplex when our renovations are done, but it will only be about 3,200 sq. 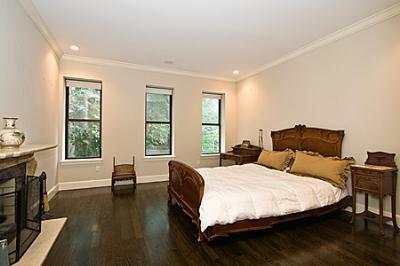 ft. – definitely a nice size, but not nearly as luxurious as 30 West 120. I’ve seen this in the comps before – single and two family homes often sell for substantially more than 3+ family homes. After I finished this post I started thinking about the effect on shells (like the one next door). If 30 West 120 can sell for $560/sq. ft. subtract $250/sq. ft. for a nice gut renovation, then subtract say $100/sq. ft. to reimburse the new owner for the trouble of going through renovation and you still have a value of $200/sq. ft. – and that would be if it were a total shell (like ours was). The shell next door doesn’t seem like a total shell, so it could go for even more. Of course one comp doesn’t make a trend, and rehab mortgages are getting harder and harder to come by, but as the high end prices go up so too will the prices of shells – and the changes on the low end will seem even more dramatic since renovations are a somewhat fixed cost. $200/sq. ft. is about 50% higher than the $125 to $140/sq. ft. I would have thought was an average shell value in the past (for a shell needing a total gut including structural work). 50% is a big jump. 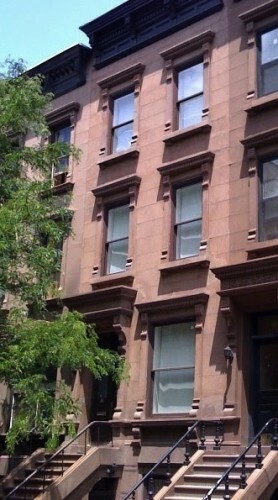 57 West 119 sold for approximately $495/sq. ft.
That means there was only one really good sale (57 W 119) and in a few weeks it will be more than a year old and off the radar. At that point the highest comp will be 148 W 120 which sold for $440 per square foot ($1.525M). That’s sorta sad. As much as real estate agents like to get listings, I don’t know how much the agents with the high end listings are enjoying all the work and advertising expense right now when not much of anything is selling north of $1.5M. The problem is when there aren’t many high-end comps the banks ay be reluctant to lend on high-end properties because there are no comps to support the price. But the comps aren’t just a problem for high-end properties. Rehab mortgages are based on estimated future value – which is based on high-end comps. So if you bought a shell for $180 / sq. ft. and you want to put $200 / sq. ft. into it, you have to hope the bank’s appraiser finds just the right comps. If they’re lazy and pick the wrong comps you could have a serious problem. (Hint: meet the appraiser in person and hand him/her a list of comps you think are appropriate – and don’t forget rental comps! so they appraise the rental value correctly as well).